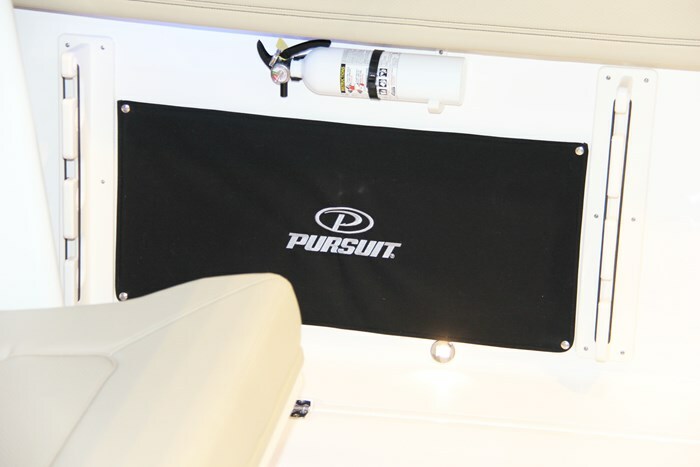 Pursuit offers fourteen models of Center Console, Dual Console, Offshore, and Sport Center Consoles from twenty-three feet to its flagship almost forty-three foot S408 Sport Center Console. 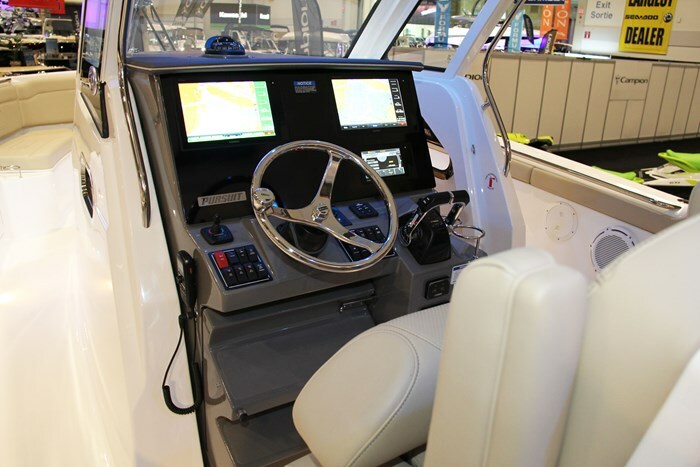 The S328 is the second smallest of four models in Pursuit’s S series of luxurious, family-friendly and versatile Sport Center Consoles. 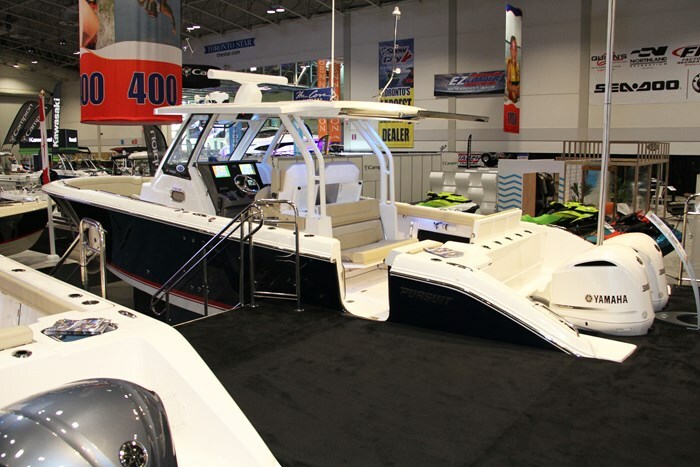 The S328 is versatile in that it is loaded with equipment and features that make it equally at home to a fishing enthusiast as well as being ideally suited for cruising, entertaining, watersports, and overnighting. 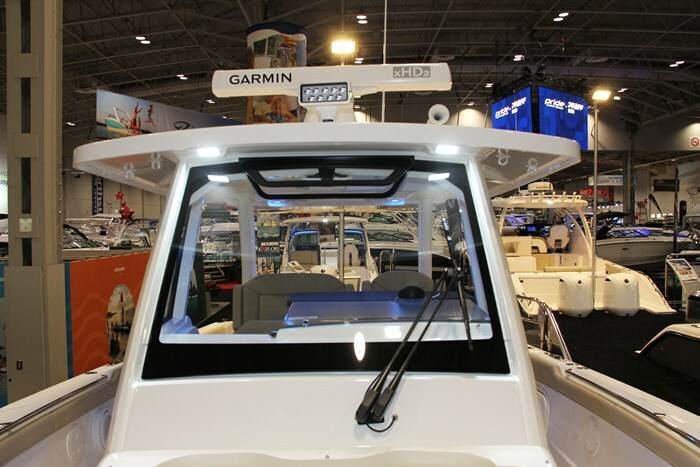 The high, full-beam molded hardtop with integrated one-piece custom windshield with powered upper vent section plus side wings provides an overhead ventilation hatch, tri-colour LED lighting, fore and aft spreader lights, four stereo speakers, a molded overhead electronics mounting surface, plus standard Strataglass™ side dodger curtains. The molded helm with tilting stainless wheel with non-slip grip and large electronics mounting surface has a fold-out footrest/standing platform and is available in your choice of four colours at no extra charge. 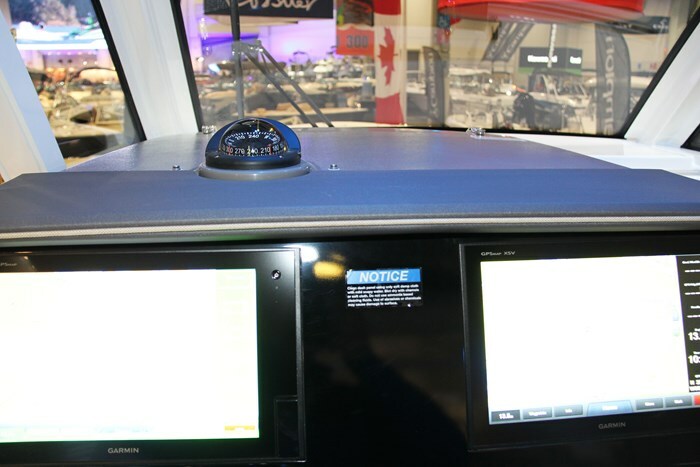 A pair of Garmin 7612 screens comes in the optional Electronics Package to which you may add radar, VHF radio, and/or autopilot. 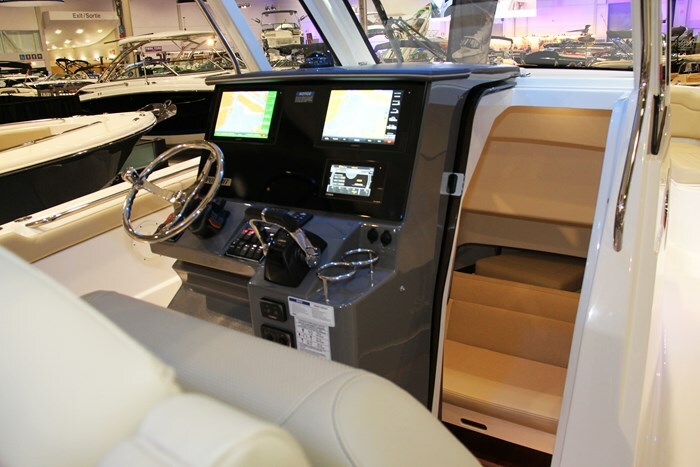 The dash also provides a stereo remote, trim tab controls with indicators, windshield wiper/washer controls, plus a pair each of 12-volt and USB outlets; all standard. 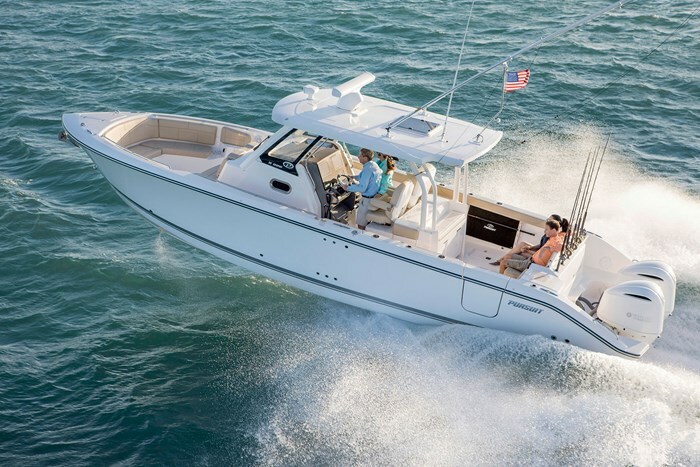 The side-by-side 60/40 configured helm chairs have fold-down armrests and forward flip-up bolsters and the captain’s chair has both slide and vertical adjustment. 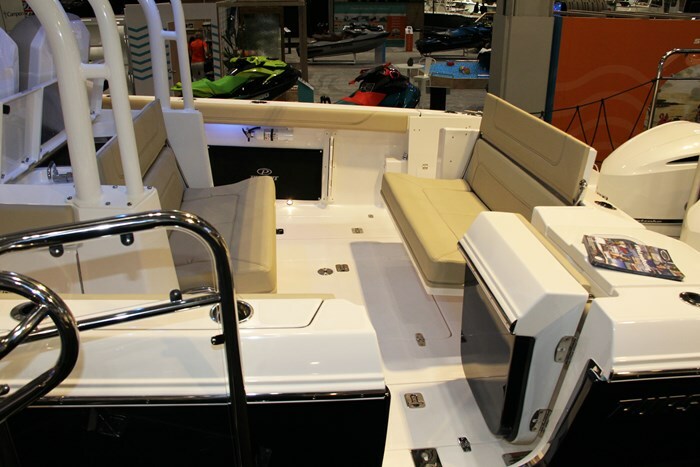 Immediately aft of the helm chairs is an entertainment center with sink, insulated cooler, cutting board, drink holders and storage. It may be fitted with an optional electric grill. 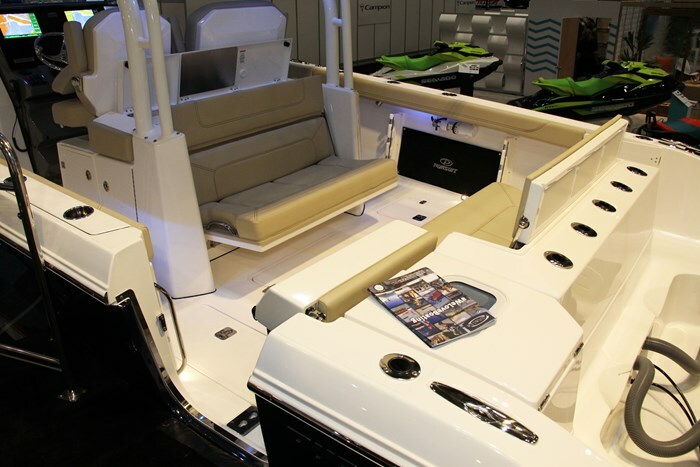 Tucked up to this entertainment center is an aft-facing fold-away two-person cockpit bench seat which faces the forward-facing two-person fold-away transom bench seat. Two standard cockpit tables with dedicated storage mount singly or side-by-side to create a full-size dinette or entertaining area. A standard cockpit stainless steel drawer-style refrigerator is provided. 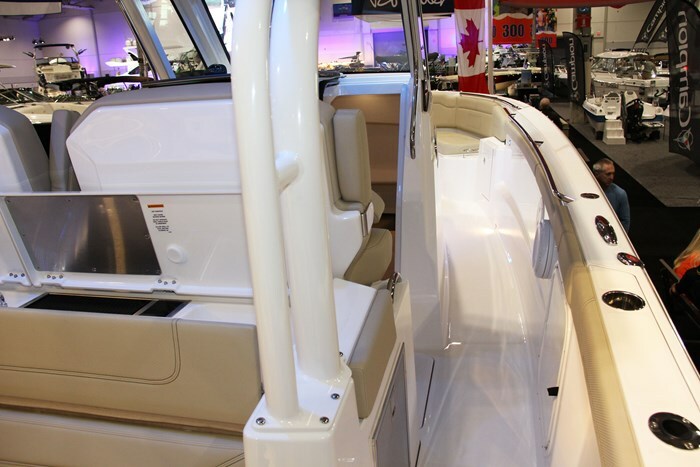 A starboard side transom walk-thru with gate leads to the swim platform with boarding ladder and integrated extensions right to the back of the motors for ease of water access. The port end of the transom houses a 24-gallon lighted Oceana Blue recirculating livewell. 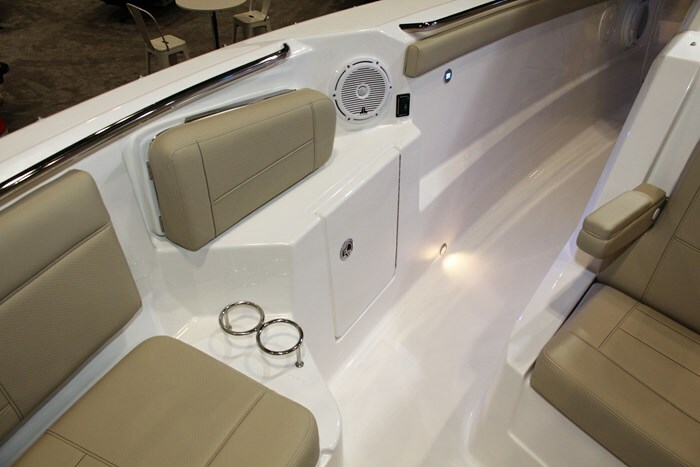 The transom also has five stainless rod holders and more of these holders are located within and under the gunnels, under the hardtop, plus inside the cabin. 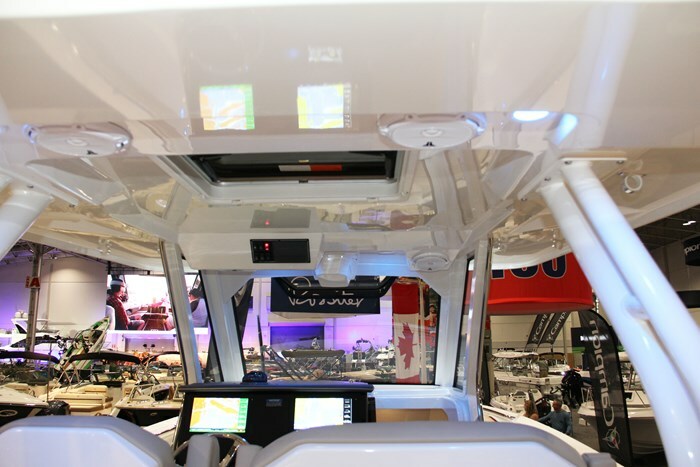 Two large insulated fishboxes with pump-outs are within the aft cockpit, one piece, self-draining floor. To port, just ahead of the transom is a hullside opening dive door with boarding ladder. 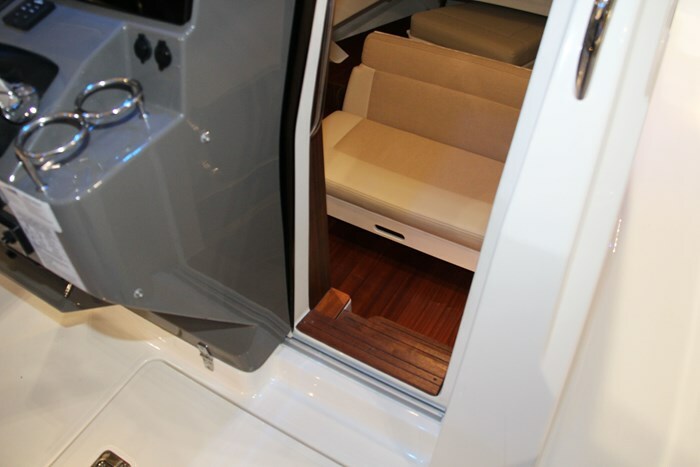 This door also facilitates easy access to the boat from a dock. Two levels of cockpit LED courtesy lighting are standard as is both raw and fresh water washdowns and a cockpit shower. On the forward face of the console is a two-person, high back forward-facing seat with fold-down armrests. 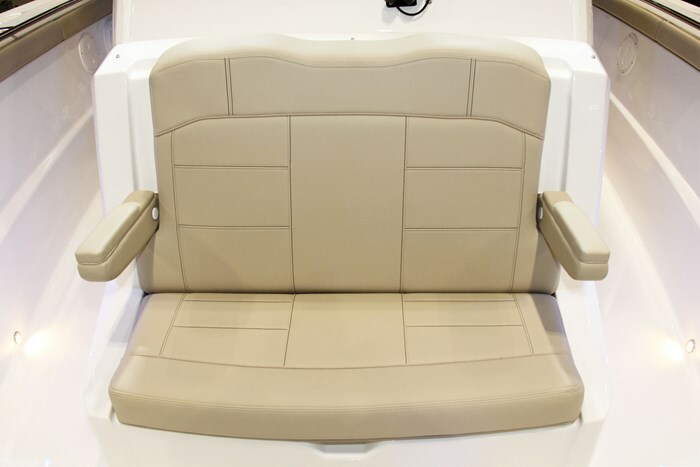 Facing it is a surrounding comfortable four or even up to six-person bow lounge seat with insulated storage beneath and an electrically powered armrest that swings out from each inner hull side to facilitate forward-facing lounging. 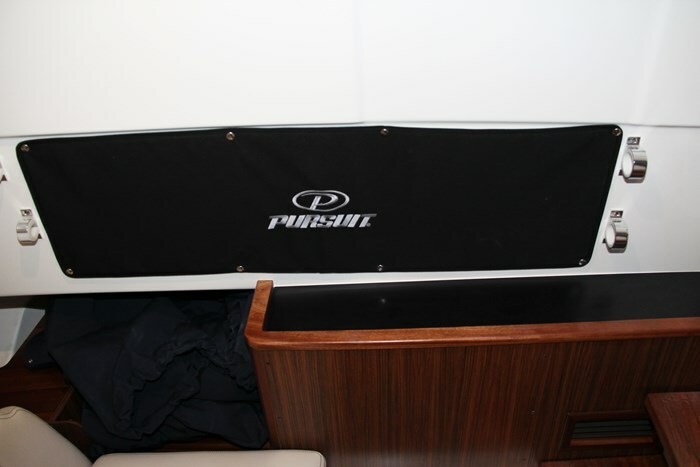 One or both of the aforementioned cockpit tables may be used here also and an optional filler cushion creates a lounging bow sunpad. 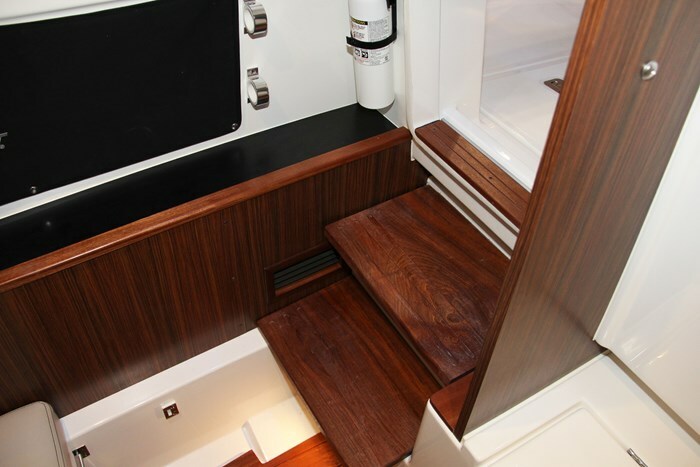 An acrylic sliding door on the right of the helm leads to the cabin below which features a couch which converts into a large double-size berth. 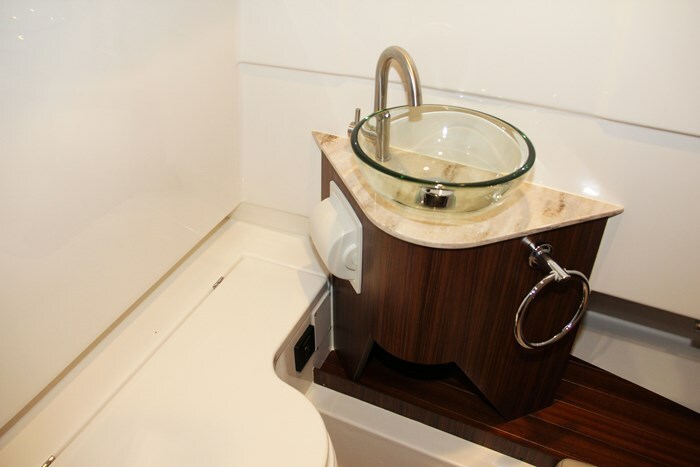 Also provided is a vacuum flush marine head with privacy bulkhead, designer sink with Corian® countertop and vanity mirror, storage, plus solid wood tongue and groove floor accents. 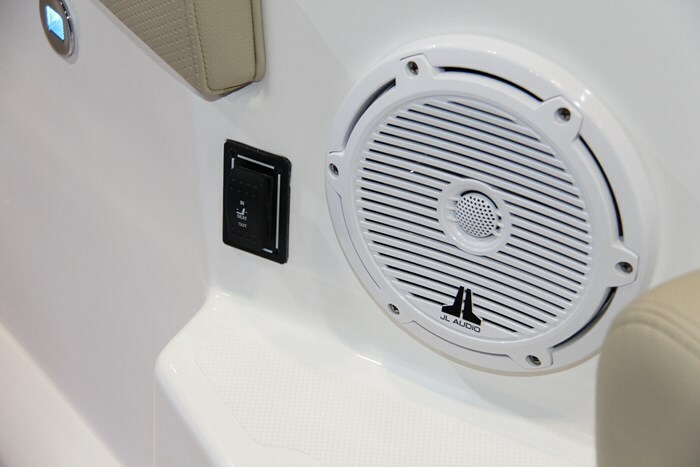 Other notable standard equipment includes a Bluetooth® compatible JL stereo with amplifier, subwoofer, seven speakers, and two zonal remotes, bow thruster, thru-stem anchor windlass, dockside power with isolation transformer, and battery charger. 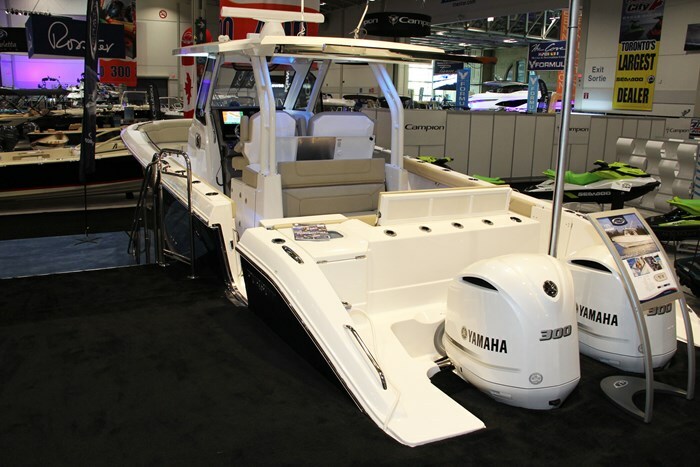 Twin Yamaha F300 outboards is the only power choice for the S328 and you may optionally choose to have them in white and with Helm Master™ control with a joystick. These motors provide an optimum cruising speed of just over 32 mph at 4000 RPM and a top speed of just under 50 mph at 5750 RPM given normal loading. Other options include four hullside colour choices, a 4.2 kW Fischer Panda® diesel generator, cabin air conditioning/heating, underwater lights, remote spotlight, powered retractable cockpit or manual stowable cockpit and/or bow sunshades, various Sunbrella® or Stamoid® covers, plus hardtop-mounted rod holders and/or Revolution outriggers. 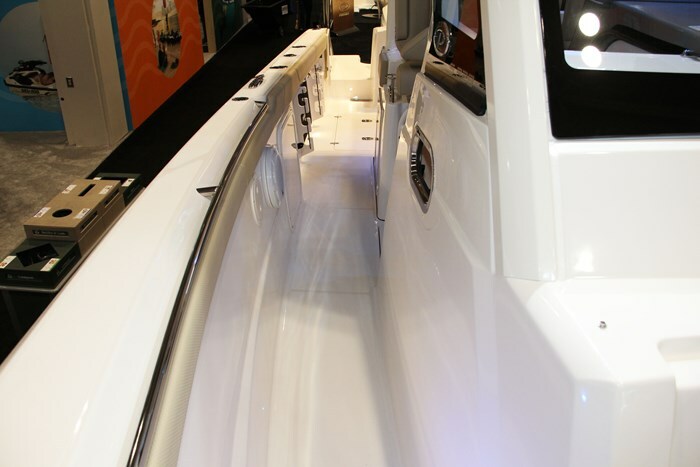 At thirty-four feet, six inches length overall on a ten foot, ten inch beam, Pursuit has packed an amazing complement of features and equipment into its S328 to equip it with the versatility to satisfy a full range of on-water recreational enjoyment in luxury.